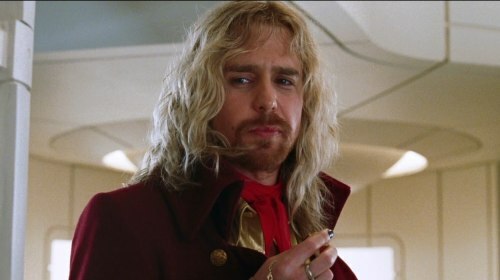 - Hey there, baby doll, - Zaphod Beeblebrox smirked at you with his most charming smirk (in his not so humble opinion), entering your quarters and leaning against the doorframe. You didn’t dignify him with the response. - Oh hey, what’s the matter, darling? - he frowned, approaching you. - It’s nothing, Zaphod, - you shrugged. - I’m just not… in my best mood today. And I miss the Earth a bit. - The Earth? Oh come on! - Zaphod flopped down on the bed next to you and wrapped his arm around your shoulders. - This planet is just boring! There are a lot of much more entertaining places in the Galaxy, you know. And we can head to any of them right now if you wish, by the way! How about that, huh? - he gave you a little playful shake. - Told you, I’m not in the mood, - you muttered. - And by the way, maybe yes, Earth is boring, but it’s my home. Did you ever miss your home, Zaphod? - Ummm… eh… Not really, - he shrugged with a helpless smile. - I figured as much. - Fine than, so tell me, what can I do to put a smile back on that pretty face of yours? - he tilted your chin, causing you raise your eyes at him and looked at you with his most tender gaze (again, in his not so humble opinion, of course). - Just leave me alone for a while. Zaphod’s face darkened for a quick moment, but then he smiled brightly again. - Hey, I’ve got a great idea! - he exclaimed, jumping off the bed and heading to the door. - Yeah, yeah, wait a second, I’ll be right back! You sighed deeply and rolled your eyes as he left the room. - What’s that? - you asked, looking mistrustfully at a mug Zaphod was handing to you. It looked and smelled incredibly weird. - Well, umm… So I asked the Nutrimatic Drink Dispenser to make you something nice and hot to perk you up a little. Come on, try it! I’m sure it’ll make you feel better! Unlike him, you wasn’t so sure. But he looked at you with such puppy eyes that you decided to give it a chance and took a sip. - Ughhh… Actually… Pretty disgusting, - you cringed. - I told you it’s a freakin stupid idea, you idiot! He gave you a surprised look, when you grabbed his hand, stopping him. - Sorry, Zaphod, - you said softly. - I told you I’m not in my best mood today, but actually I really appreciate that you try so hard to cheer me up. - Yes. It means a lot, - you smiled and he beamed at you. - I have one more idea and I’m sure it’ll work. - Oh no. What’s that? - Hm… yeah, that might work, - you replied with a smile. - Come here than, baby doll. As he held you tightly, enclosing you into his arms, you couldn’t deny that he really managed to make you feel better. Much better, to tell the truth.